Texada Island is located in the northern Gulf of Georgia, between the Strait of Georgia and Malaspina Strait. Texada Island is the largest island in the Strait of Georgia of British Columbia, Canada. Its northern tip is located about 8 kilometres (5.0 mi) southwest of the city of Powell River and west of the Sechelt Peninsula on the Sunshine Coast. A former mining and logging area, the island still has a few quarries and old logging roads. It is the largest of the Northern Gulf Islands at some 50 kilometres (31 miles) in length and 10 kilometres (6.2 mi) in width, with its length aligned along a northwest-southeast axis. The island is 300.45 square kilometres (116.00 square miles) in land area and had a population of 1,053 in the 2011 census (1,107 in 2006, 1,129 in the 2001 census). The main settlements are Gillies Bay, Blubber Bay and Van Anda. Other islands in the archipelago are Lasqueti, Jedediah, Harwood, Nelson, Hernando, and Savary Islands. Texada is separated from the mainland and Nelson Island by Malaspina Strait on its northeast and from Lasqueti Island by Sabine Channel along its southwestern flank. Off its northwestern end it is separated from Harwood Island by Algerine Passage and is flanked by the Strait of Georgia on ¾ of its western side. Texada was named by the Spanish naval explorer José María Narváez for Felix de Tejada, a Spanish rear-admiral during the 1791 expedition of Francisco de Eliza. Narváez gave the name Isla de Texada to what is now called Lasqueti Island, and Islas de San Felix to Texada Island. The maps made by Eliza and Juan Carrasco in late 1791 moved the name "Texada" to the present Texada Island. The pioneer steamer SS Beaver would often stop at Texada Island to load up on wood and freshwater in its travels up the coast. At the time of Confederation the north end of the island became a fishing outport. For a few years, humpback whales were flensed on the beach, giving the place the epithet of Blubber Bay. Grey Whales migrating from California to Alaska pass by Texada Island. Twelve basking sharks were slaughtered as sport in Blubber Bay in 1947. In 1876, a whaler called Harry Trim discovered iron ore, and mining began in earnest. Iron mines were explored and floated in 1876, with Premier Amor de Cosmos being involved in a land and mine scandal. The iron was used off and on—some going into Seattle built battleships, the USS Oregon, for the Great White Fleet; gold mining was also important. Copper was discovered at Van Anda about 1898 by Olive and Harry Treat creating the Cornell Mine rich in copper and gold. A smelter, tramway and town was constructed. The community was named after Carrie Van Anda, wife of American mining capitalist Edward Blewett. J. D. Rockefeller invested in the iron mines, though he quickly sold having lost money on a Monte Cristo, Washington venture near Everett. The iron mines were picked up by the famed Union Iron Works of San Francisco. Canadian investors Sir William Mackenzie and Donald Mann also speculated in the Van Anda mines. Farms, orchards, logging and a sawmill were set up on Texada at this time as well. By the turn of the century, the copper boom was in full swing but the mines only yielded for a few years. Van Anda hosted an opera house and a Chinatown. A series of fires demolished the Van Anda townsite—the last in 1917. Sail races were also run from Vancouver to Van Anda around this time. By 1910, Pacific Lime Company and BC Cement had set up limestone quarrying operations at Blubber Bay and Marble Bay. For almost a century, limestone quarrying continued. Much of the product was shipped to Seattle, Oregon or California. Railways, cableways and concentration plants were built for the mines, as was the arbutus-shaded company town of Blubber Bay. Limestone pits were dug all around the north section of the island. Lime kilns for sintering quicklime were raised around the northern end of the island. One survives at Marble Bay and gives the name to Lime Kiln Bay. Other mines included an iron ore mine near Gillies Bay run by Kaiser Aluminum which shipped ore to Japan and Germany after 1945. 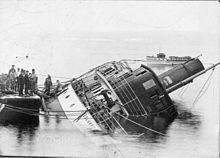 Cheslakee capsized at Van Anda, BC, 22 Jan 1913. A floating hospital was built by Columbia Coast Mission Boats and moored at Van Anda, until its need was greater in Knight Inlet and was moved[when?]. During U.S. prohibition, the island was a supply point for illegal alcohol into the United States, with a famous illegal distillery operating on the east shore. The remains of the hooch boiler can be seen on the beach. On November 6, 2004, the tug Manson, skippered by Dusty Davison, sank off Texada Island. A regular ferry service links Powell River and the main ferry terminal at Blubber Bay. The first ferry to the island, after the discontinued Union steamships, was the Atrevida. The island has two stores, a library, Credit Union, gas station, elementary school, hotel, bed and breakfasts, The Ravenous Raven Restaurant, two museums, two firehalls, an R.C.M.P. Detachment, Ambulance station and two post offices. Located near Gillies Bay, Texada Island also has an airport (Call Sign YGB) with a 3,000-foot-long (910-metre) paved runway for private aircraft and scheduled services. There are parks, forests, lakes, beaches and mountains. Parks include South Texada Island Provincial Park and Shelter Point Park. Texada has a combination of light and soil conditions suitable for market agriculture. Large vegetables have been known to grow on the island[specify]. Today, the island caters mainly to weekending tourists and hunting season. A sandcastle contest is held in the summer on the occasion of the lowest tide of the year in Gillies Bay. A BC Hydro 500 kV powerline known as the Cheekye-Dunsmuir Line was built in 1982 running east to west across the middle of the Island, linking two sections of underwater transmission line that deliver power to Vancouver Island. A FortisBC natural gas pipeline, built in 1989, runs from south to north, where it splits, providing gas to Powell River and Vancouver Island. The island has produced 5 million tons of limestone a year; however, recent economic factors have lowered demand. In 2007, Westpac LNG announced that it intended to build a liquefied natural gas (LNG) receiving terminal, and a gas-fired electricity generation project, at Kiddie Point on the north end of Texada. Controversy surrounding the project ramped up quickly: the year also witnessed the re-introduction of Texada Action Now by Texada residents, and the formation of the Alliance to Stop LNG, comprising a large number of conservation, environmental, community and labour groups around the Georgia Basin. As of summer 2009, the project was shelved for the time being due to the global economic downturn. Jennifer Tilly, Canadian-American actress and professional poker player. ^ "Population and dwelling counts - StatCan" Retrieved 8 November 2014. ^ "Texada Island". BC Geographical Names. ^ McDowell, Jim (1998). José Narváez: The Forgotten Explorer. Spokane, Washington: The Arthur H. Clark Company. pp. 58–59. ISBN 0-87062-265-X. Heather Harbord, Texada Tapestry. Harbour Publishing, 2009. This page was last edited on 3 March 2019, at 03:31 (UTC).